MarketersMEDIA / Newsroom / Vinpocetine – Does It Provide the Key for a Natural Focus Boost? Vinpocetine – Does It Provide the Key for a Natural Focus Boost? As a result of our fast-paced modern lifestyles, more people are in a constant battle to focus on their activities of daily living. Boostceuticals Nutrition aims to help everyone to win back their focus with their all-natural GMO-free and Gluten-free Vinpocetine. New York NY, United States - March 28, 2019 /MarketersMedia/ — The possibility of “better brains” has captured the attention from people of all walks of life. There is a special feeling of self-satisfaction from being able to recall names and numbers faster, having a strong mental energy that can last all through the day. Yet even in the midst of this buzz, the idea that a capsule can supersize human capacity is still decidedly science fiction. But it didn’t stop the search, rather several of real-world researchers and drug-makers are working to develop science based nootropic supplements and other substances designed to improve various aspects of cognition. One of the most studied nootropics is Vinpocetine. It has been the subject of various clinical studies. The results range from faster reaction time to better scores on cognitive impairment and dementia tests. 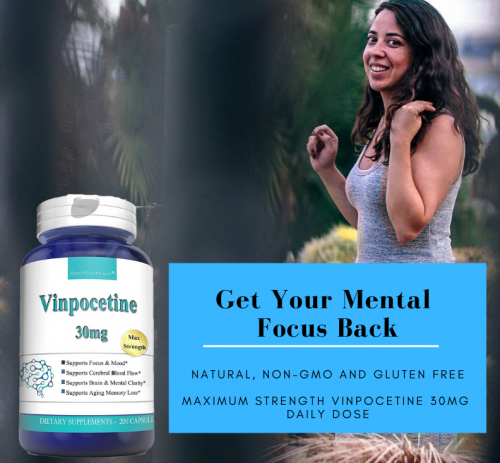 Vinpocetine, derived from the plant periwrinkle, is a natural nootropic that boosts cerebral blood flow to the brain and has antioxidant properties. “Vinpocetine is often called the ‘smart nutrient’ for its studied ability to help improve cognitive function and memory by increasing blood circulation through the brain,” said the Boostceuticals, one of the forerunners in Natural Dietary supplements. They added that the brain only accounts for about 2% of a person’s bodyweight, but it consumes about 20% of the oxygen and nutrients circulating in blood. This is why strong, healthy cerebral blood flow is so critical to brain health and cognitive performance. Boostceuticals is dedicated to supporting people on their pursuit of supreme brain-health. With the right blend of nature and science, all Boostceuticals supplements are manufactured to the highest-quality standards in the USA in an FDA certified facility adhering to all GMP requirements. Every step is taken to ensure the development of superior and best quality nutritional supplements. With its use of natural ingredients and being GMO free and gluten free, it has become the sensible and healthier choice for every American household.